Christmas is an ideal time to show your staff that you are truly grateful to them for the amazing work they have done all year. Here at Zenith Payments (the mother company of Corporate Prepaid Gift Cards), we place enormous importance on our company culture and we take every opportunity to thank our staff for upholding our values. We like to refer to our staff as ‘’Zenstars’’ to promote a positive company culture internally. We value staff members from all walks of life and are accommodating with flexible working arrangements wherever possible. Birthdays are always celebrated with a cake and everyone gets a day off for their birthday. We have a bonus day off at Christmas. Each week we have Thursday night drinks and nibbles so we can spend some enjoyable time together and catch up on the week that was. We really do enjoy our social time together. Here are some ideas to help you say a big THANK YOU to the people who make your company rock! A Christmas team shopping spree. Give them a $100 prepaid gift card to spend on themselves. Extra-long special team lunch. Everyone loves eating, and everyone loves a free lunch. ‘’Academy Awards’’ style awards ceremony highlighting what your company has achieved, your growth, and how everyone contributed to your success. Be sure to give examples how all titles and levels within the organisation attributed to the company’s success. Bonus ‘Day Just for You’ day off for staff over Christmas. Family Christmas party with Santa, rides and goodie bags for the kids. Fitness program for summer/contribution to fitness plan for new year. 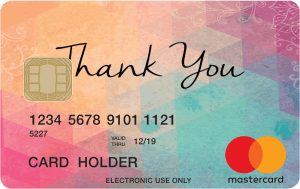 A prepaid gift card can be put towards gym membership/yoga or Pilates classes/meditation breaks – the choice is theirs. Ultimate travel program for the following year. You can give them a Prepaid Reloadable Mastercard/Visa card to help them save for their dream holiday next year. You are able to top up the card each time an achievement is made or milestone reached. Add in bonus leave days. Fresh fruit and healthy snacks delivered daily for the month of December to promote health and wellbeing. Lavish day out on a boat. Everyone loves a day out on the harbour or river. Charitable giving. Staff get to select a charity that your company will support. Host a morning tea and staff can donate a gold coin to the chosen charity. Here at Zenith, we support The Harding Miller Education Foundation. Team indoor ping pong/ outdoor cricket tournament or another fun competitive team activity. Walking meetings to promote good health and energy.Clean their house for a month. Give them a Visa/Mastercard gift card to pay for this. Office Puppy. Just like Lizzie, our office dalmatian here in the office. Kris Kringle. Tried and tested. Everyone chooses a name out of a hat and buys that person a gift. Write a personal Christmas card thanking them for being who they are and outline how they really do make a difference and that the company truly values them. If all else fails, buy them a prepaid gift card for whatever they like! They will be guaranteed to love it!